TABOO is designed for that special adventure and thrill seeking owner, who likes to explore the furthest corners of the globe with friends, family and like-minded adrenaline junkies. She is a high-volume purpose built expedition yacht for extreme polar and tropical adventures, with the performativity of a commercial vessel, whilst offering the highest levels of luxury in the most remote places on earth. Discover the world by plane, helicopter, submarine, amphibious car, supercar, a range of luxury tenders and water craft, or hot air balloon. It's all aboard and ready to thrill you at a moment's notice. Nothing is impossible, or out of bounds. Nothing is beyond limiits on this truly unique yacht. Ready for a beach side night club, alfresco banquet or dual level beach parties around a magnificent glass pool, lined with exotic aquariums? For the owner who entertains on a grand scale, TABOO has it all, with an unprecedented range of spaces that can transform within minutes from intimate private spaces, secluded from the outside world, to party spaces with vast indoor-outdoor facilities - absolute privacy when required, openness, adaptability and an unrivalled experience of the environment and ocean at all other times. TABOO's 'monochromatic exterior styling' sets her apart from all other vessels in her range, featuring sophisticated lines, yet keeping the language classic and refined. White one way glazing is strategically used throughout the vessel, giving panoramic views from owner - and VIP suites through to vast open party - and lounge spaces. Breathtaking views and interactions with the environment are offered, but never at the cost of absolute privacy and seclusion when wanted. TABOO features an open double height tender bay with an A-framing lifting arrangement, and a helicopter landing with a retractable fully enclosed helicopter garage. In addition, the spacious enclosed tender garages on the lower deck can accommodate tenders up to 14+ meters. 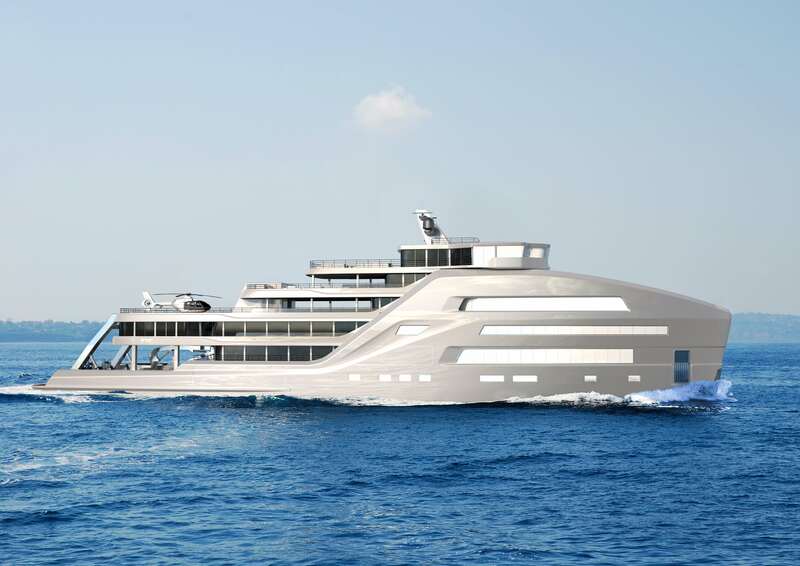 Any type of tender can be housed on this explorer yacht. This vessel truly performs beyond its length and size. The interiors are as unique as the exterior styling, the adaptability of the entertainment spaces being one key aspect of the designs. The large two floor guest lounge/pool space and beach club with a full height pool located on the main and upper deck, flanked with aquariums either size, allow for an experience of swimming with the fishes when the ocean outside is just a little too cold. Other features include two Jacuzzi's, an extensive guest gym and spa area, a breathtaking cocktail lounge, expansive beach club and pool area, guest lounges and an aft summer house which can operate either as another exquisite lounge space, additional VIP guest quarter or casino.